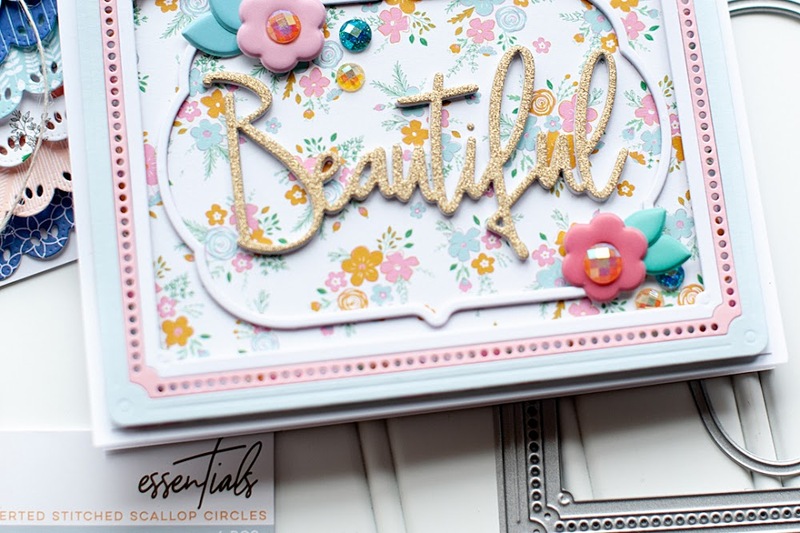 I told you I would have a card full of product and layers to share with you, and today is the day! I know I have done quite a few clean & simple cards lately...I just happen to like both styles! I get the best of both worlds, since I feel like I can do both fairly well. 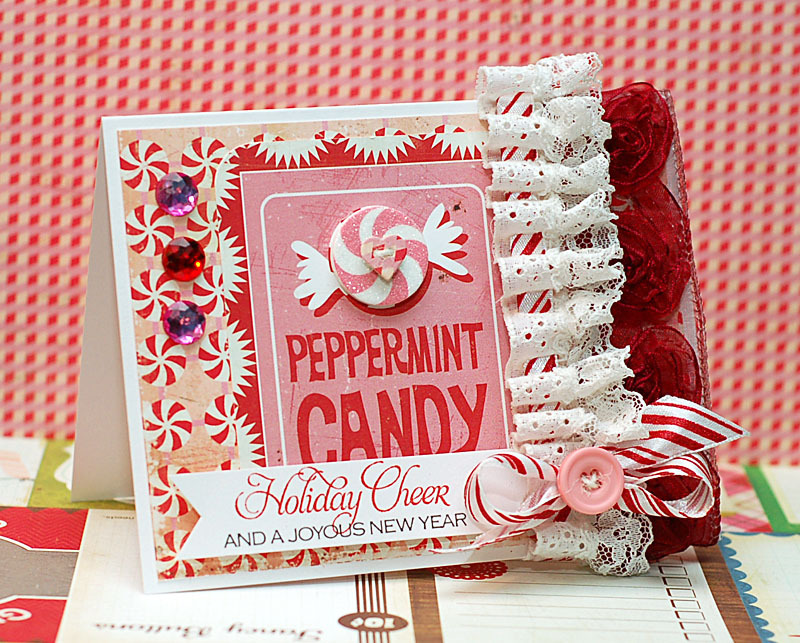 Today's card uses the Prima Marketing "Tea Thyme" collection, and some stamps & dies from the latest WPlus9 release. Check it out! 1. 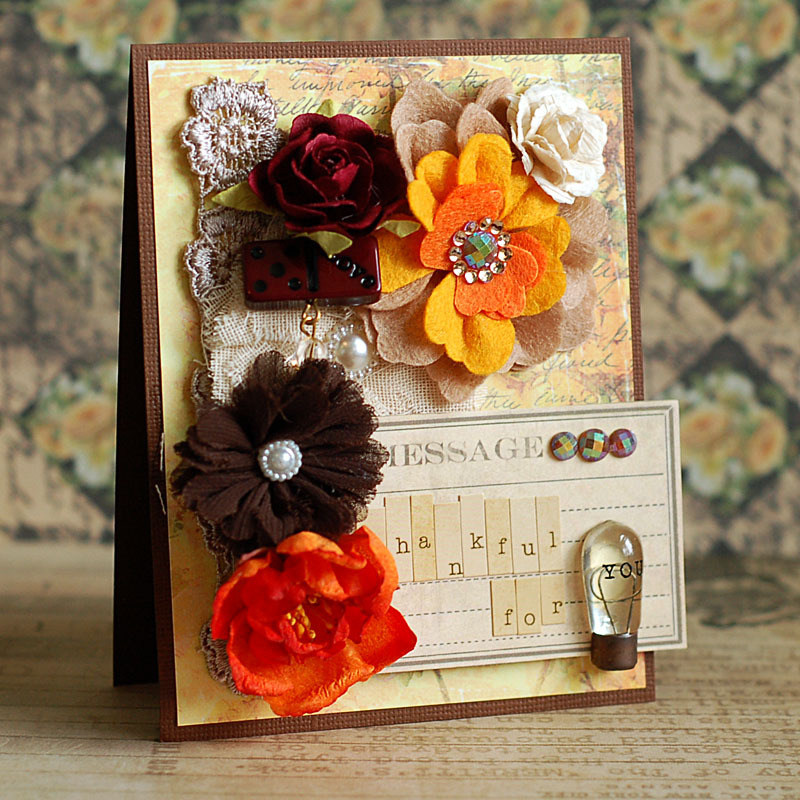 Make a 5-inch square card from vintage cream cardstock. 2. Distress ink a floral paper block, and adhere to the front. 3. Distress ink a polka dot paper strip, and adhere to the left side. 4. Distress ink a doily, and adhere to the middle. 5. Wrap pink trim & ribbon around the seam. Tie a bow at the top, then layer with a twine double bow & pink button. 6. 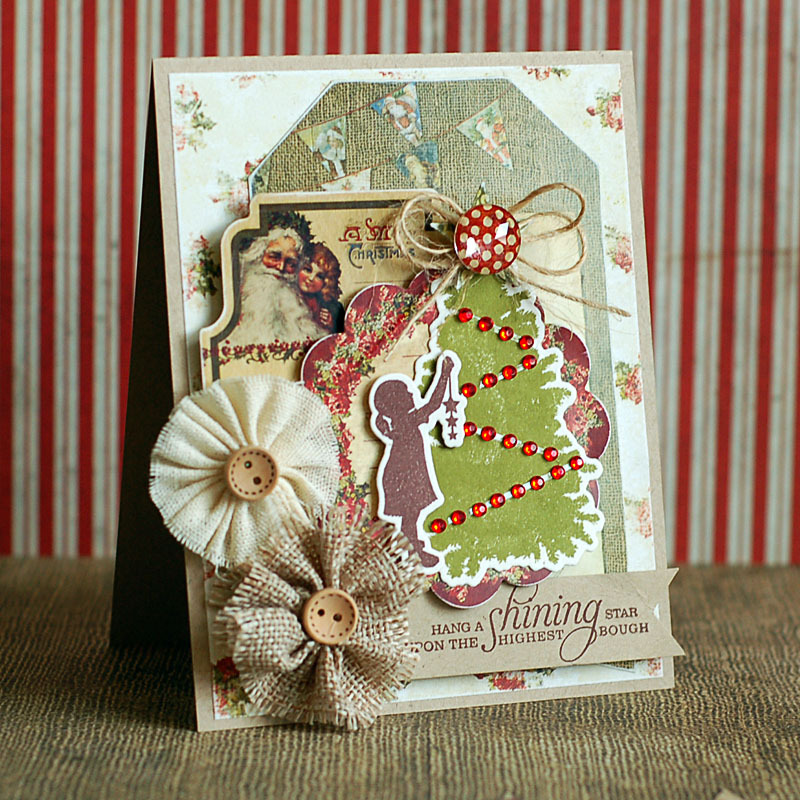 Diecut a tree from vintage cream cardstock, distress ink and then add Stickles & chunky glitter to it. 7. Wrap twine around it as garland, accent with pearls & adhere to the front. 8. 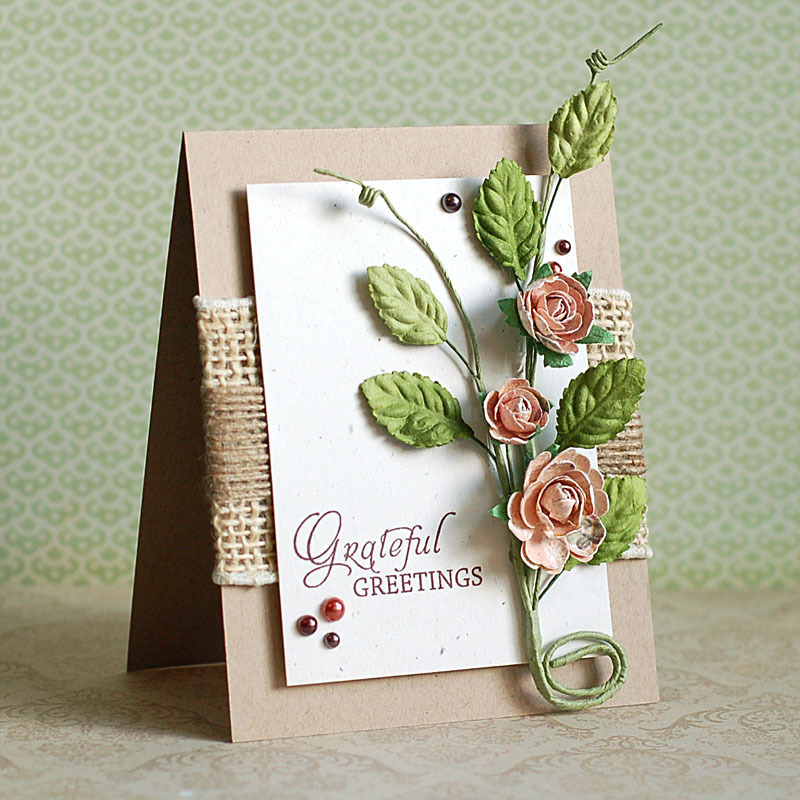 Add three fabric flowers to the card front. 9. Diecut the banner, "love" & the snowflake, then distress ink the edges of them all. 10. Stamp the sentiment to the banner, and adhere to the front. 11. Add the diecut word directly below the sentiment banner. 12. Top the snowflake with a heart jewel, and adhere to the banner corner to finish. This pink Christmas card just warms my heart a little bit...loving the glittery tree with pearl accents SO much. The flowers are pretty fabulous too.... Sigh- I love Prima!! Well, I have some Bible study notes to share with you today. So, let's get to it! and no deceit was found in His mouth. Instead, he entrusted himself to Him who judges justly." Jesus is our ultimate example of grace in suffering. An innocent man, he died a horrible, painful death on the cross. I can't think of anything more awful. Yet, He did it willingly, prayerfully....knowing the reason it had to be done. God has never said we won't suffer. It is just a part of life. He has said he won't ever leave us or forsake us...and He offered up His son so we might have a path to Him. I have gone through some hard things in the past year and a half. Things that drudged up a lot of hurts from my past. They aren't things I plan on sharing publicly, but during the hardest moments...God was there. Comforting me as I cried out to him. Being the person that I needed Him to be, when others weren't. I didn't act with the grace that Jesus had during those times though....not in any way, shape or form. I did retaliate verbally to the hurts. I did threaten....not with violence, but with the only things I felt like I had control over. I'm not proud of my reactions. But, God knows that. And He continually, gently reminds me that I need to be more like Jesus. And I'm working on that...every single day. I'm working on that. Happy Saturday, everyone! How is your weekend going so far? It is COLD here...so cold. Blech...pretty much hating it. But, I am going to venture out for a little bit today and go to a craft thing with my friend, Misty. Her daughter is working at it to raise money for cheer....and I want to show my support! Hopefully I will find something cute to buy! I went to a craft bizarre with my mom a few weekends ago, and got two really cute & unique necklaces, and they didn't cost me much. So, you just never know! I have a sympathy card to share with you today. These are never my favorite cards to create, but it is important to have them on hand because you just never know when you are going to need one. I always tend to create very clean & simple cards for sympathy. This way they are easy to slide into an envelope and get sent out...plus the sentiment is really the most important part. I combined stamps from the new company CAS-ual Fridays Stamps, and Papertrey Ink, and they were the perfect fit together to convey the message I wanted. Here is what I created! 1. Make A2 card from blue cardstock, then tear the bottom of it. 2. Cut a white cardstock block slightly smaller, tear the bottom of it and adhere. 3. Stamp the flowers to the right side of the white block, and to grey dotted paper. 4. 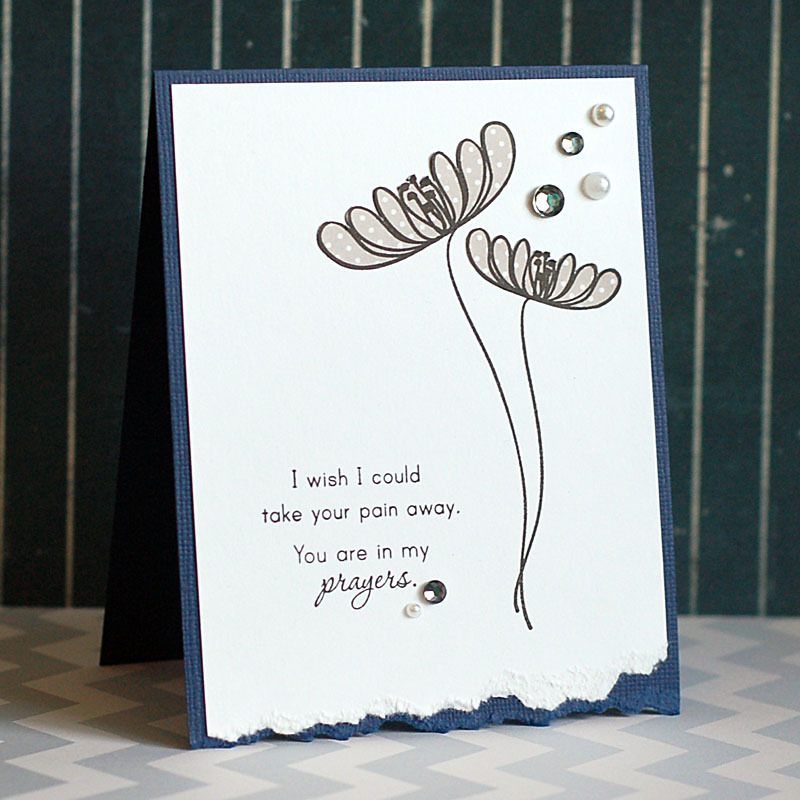 Cut out the flowers tops from the grey dotted paper, and layer to the card front. 5. Stamp the sentiment to the left of the flowers. 6. Accent with jewels & pearls to finish. The thing about sympathy cards, is that I often feel like the sentiment seems forced, or fake. I love this sentiment set from PTI...and this one was just perfect. It just seems....real, I guess. Not sure how else to explain it. What a completely fitting time to read these verses, as the election was just this past Tuesday. I was puzzled (and I can admit, a little amused) by all the negativity and doom & gloom posted as the results started to filter in. I can understand disappointment when your candidate is defeated. But I don't understand the blatant hate and dismay portrayed towards our re-elected president. You don't have to agree with his politics...but as Christians we are called to submit ourselves to our leaders. Verse 17 pretty much says it all. "Show proper respect to EVERYONE, love your fellow believers, fear God, honor the emperor." I did not see a lot of respect on either side, which makes me sad. We live in this great nation where we have all these amazing rights...one of them the right to vote. Not everyone in this world gets that right....ever. Our current president won the election, both electoral & popular vote....and for that alone, he deserves our respect & loyalty. I am reminded that regardless of who is in the White House....God is still the same yesterday, today and forever. I do not put my hope in man, but in Him. I will not fret over our politicians... I will respect them, respectfully disagree with them when I see fit because I have that right, and most importantly...pray for them. Our president has one of the hardest jobs in the world...have you seen how much he has aged in just the past 4 years? Whether you care for his politics or not...he absolutely needs our prayer. 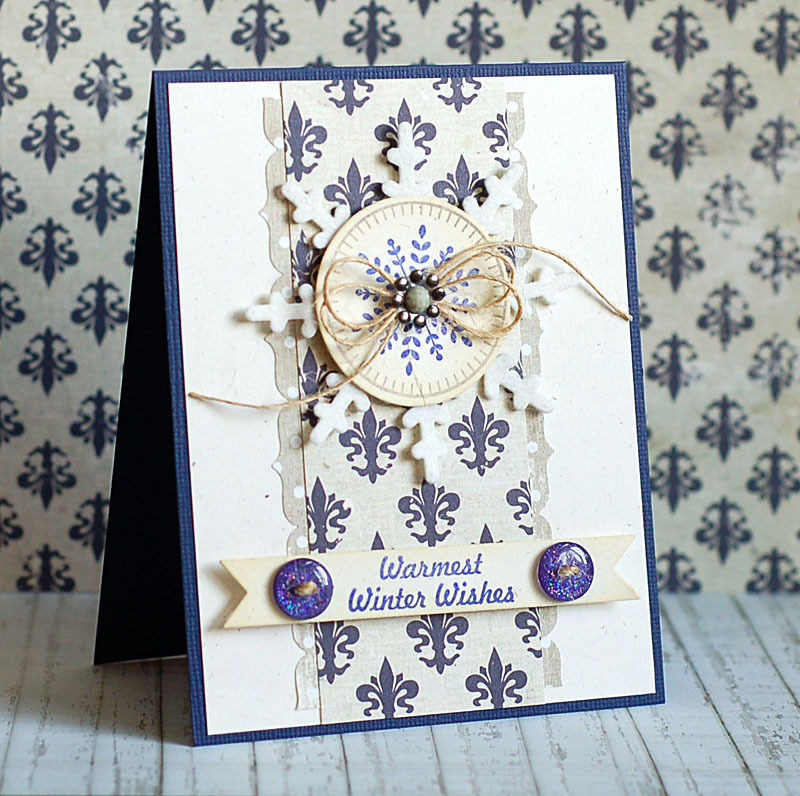 I have a sweet & simple winter card to share with you today! It uses a little bit of the Prima "Firefly" collection, and some Papertrey Ink stamps. It's been awhile since breaking out some of my PTI stamps, and these are some of my faves. Here is what I created! 1. Make A2 card from purple cardstock, then round the bottom corners. 2. Round the top corners of a floral paper block, and adhere to the front. 3. Round the bottom corners of a white cardstock block, and adhere to the front. 4. Stamp the sentiment to a matching purple cardstock strip, and adhere across the seam. 5. Wrap twine around the top of the sentiment strip two times & adhere. 6. 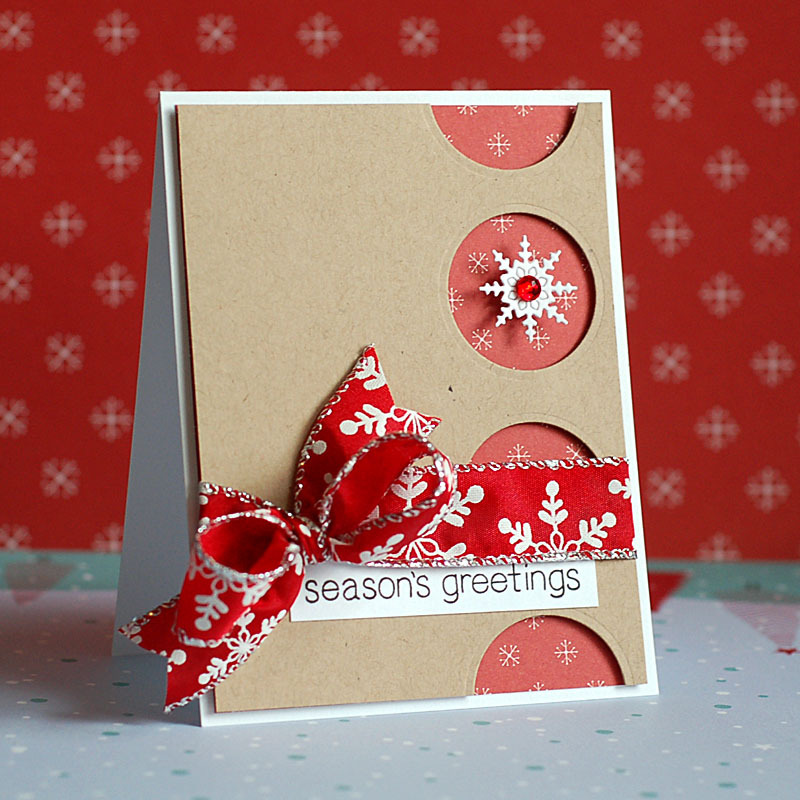 Stamp the snowflakes to the right side of the white cardstock, block, then accent with a twine bow & jewels. 7. Adhere three flowers to the upper right corner to finish. I hope you enjoyed my sweet little winter card today! It's funny...I am normally NOT a fan of purple. At all. But, I think I like it here. Not that I am going to surround myself in the color by any means...but I think I can take it in smaller doses like this. Tee hee! Well, I have some Bible study notes to share with you....so let's get to it! Now- I am a fiercely independent person. Probably too much so at times. But there is something so reassuring when I read this verse. It makes me feel safe. Loved. Known by God. I am His. Not in a crazy, dictatorship type of possession....because I still had to choose Him. But in an "I am yours, you are mine" way. It's reciprocal. As much as I want God in my life....He wants me as His even more. Happy Monday, everyone!! I hope you have had a good start to your week so far! Today has been pretty quiet for me. I did get this card created, and we went to lunch at HuHot Mongolian Grill. My brother got Josh a gift card from there for Christmas last year...and we finally remembered to use it. So...thanks, Case! You're the best!! Tee hee! 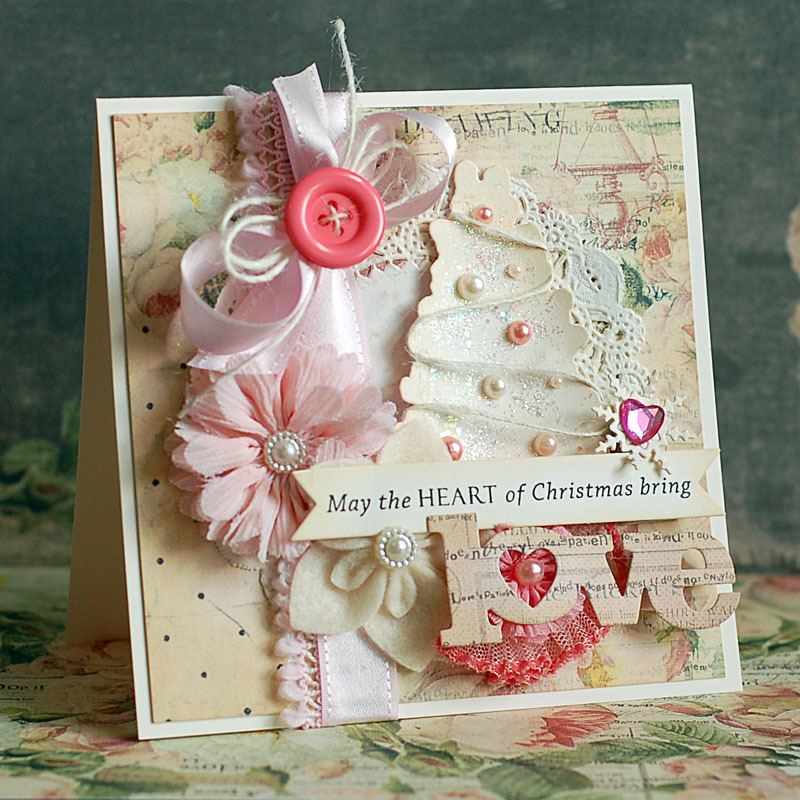 I have a lovely little Christmas card full of layers to share with you today!! 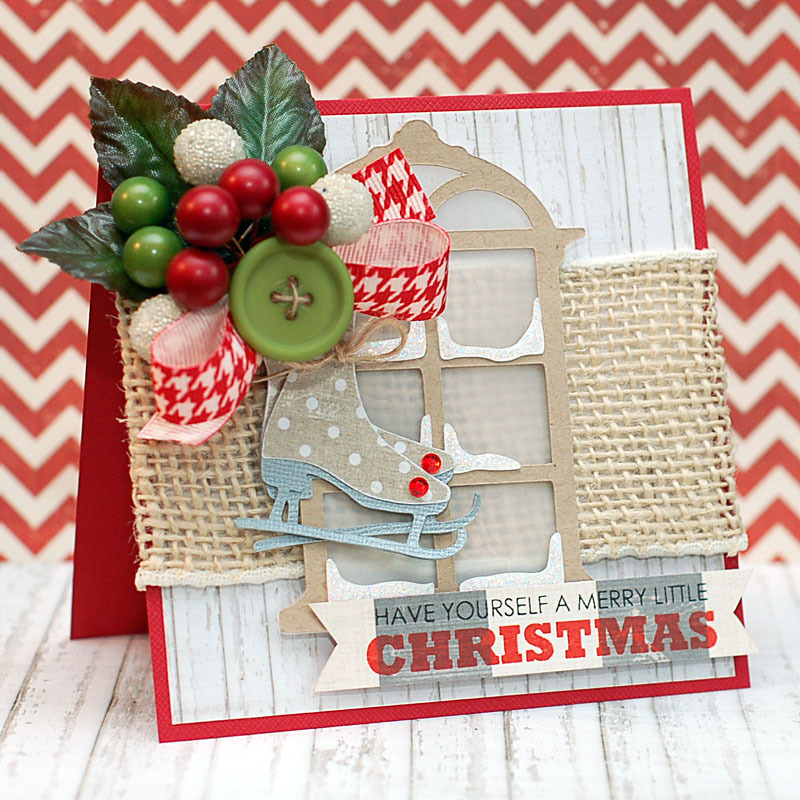 I love how well the Glitz Design "Joyeux Noel" collection and the WPlus9 "Iconic Christmas" stamps work together! They both have that lovely vintage flair to them, with a little bit of trendy thrown in. 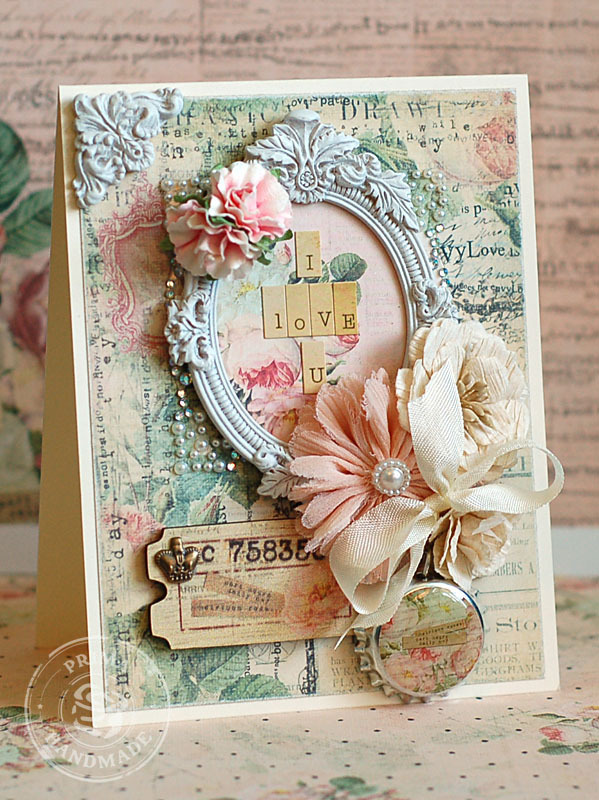 Add some Prima flowers...and you've got one of my favorite types of cards created!! Check it out! 3. Sand the edges of a banner tag, and adhere to the right side. 4. 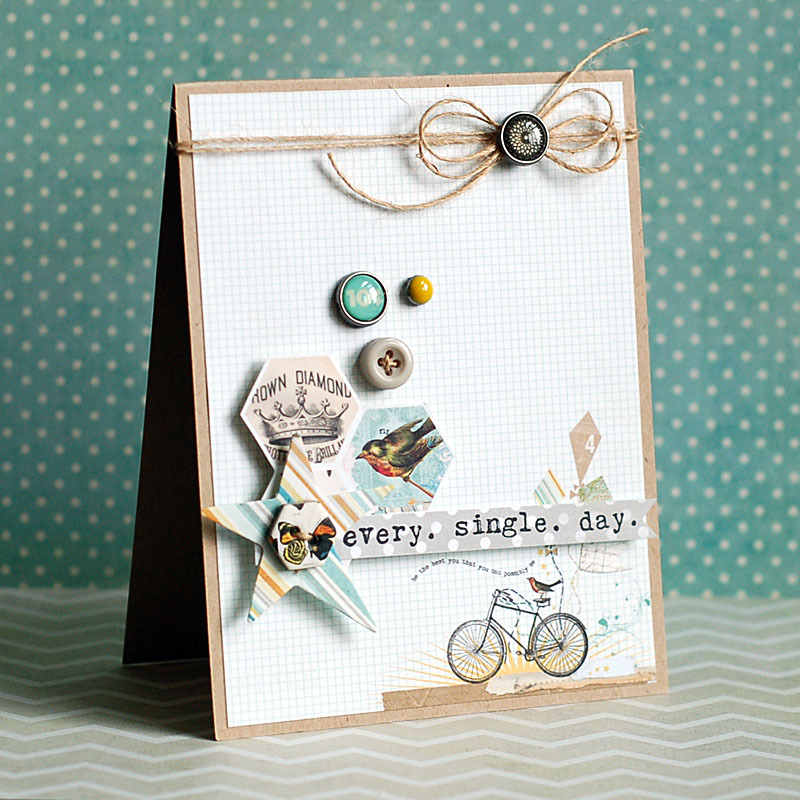 Sand the edges of two journaling stickers, and layer together to the card front using foam adhesive. 5. Diecut the tree & girl from oatmeal cardstock, stamp the corresponding image and adhere them to the front. 6. Diecut a star from patterned paper, and layer to the top of the tree with a twine bow & polka dot rhinestone. 7. Accent the rest of the tree with red rhinestone strips. 8. Cut a banner edge to a kraft cardstock strip and stamp the sentiment to it. 9. Adhere to the front with foam adhesive, then layer two fabric flowers to the left side of it to finish. Verse 22 is what really stuck out to me in this set. It says in the NIV, "Now that you have purified yourself by obeying the truth so that you have sincere love for each other, love one another deeply, from the heart." The Message translation says it like this, "Now that you've cleaned up your lives by following the truth, love one another as if your lives depended on it." How hard is that one? Especially for Americans...we are SO independent minded, that it is hard to truly depend on others. But then I look at myself and wonder, do I sincerely love fellow Christians and just others in general? The word sincere means free of deceit, hypocrisy or falseness; genuine & real; pure. I'm certain that I love the people who are most important to me in this manner.....but I'm not sure sure about others in general. I want to genuinely love others....the way that Christ does. But people don't always make that so easy. So, that is my prayer...that He would help me to see people in the way that He sees them. I know....way easier said than done. But, it is still a goal...something to seek after...because it is important. Happy Sunday, everyone! I hope that you have had a fabulous weekend so far! 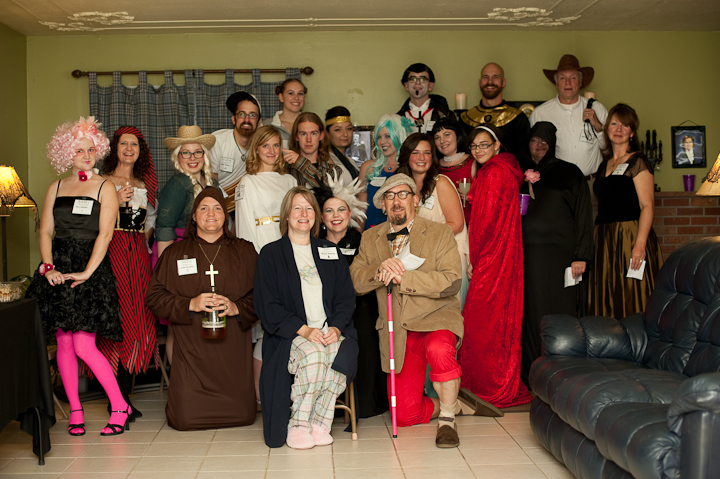 We went to a murder mystery party last night, and it was SO much fun!! 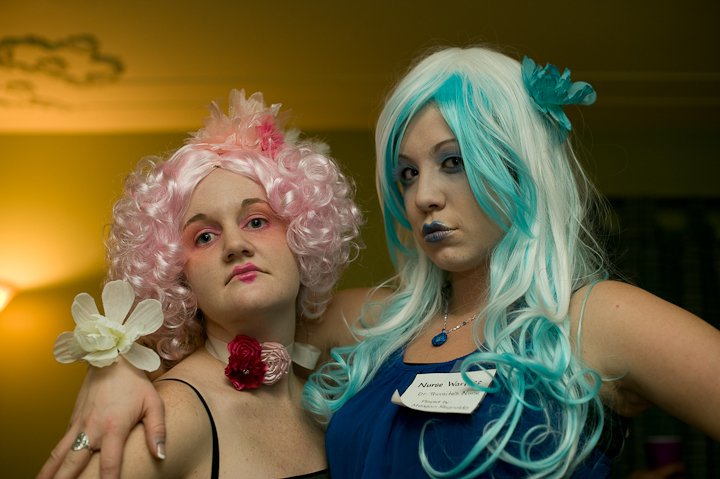 It was a costume party, so that is when me & my friend Meagan dressed up in our Halloween costumes. 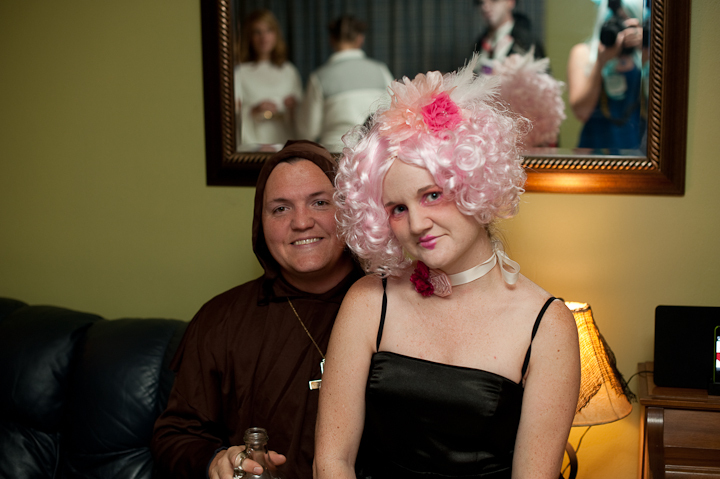 As I said before, we were Capitol people from the Hunger Games...and my costume was basically supposed to be Effie Trinket. They turned out FAB!!! I will post a couple photos below from the night! I have a harvest themed Thanksgiving card to share with you today! It features the My Mind's Eye Lost & Found 2 "Sunshine" papers, and some stamps from WPlus9 that I never had the chance to use as I had to skip that release week. I am SO glad I was able to pull them out and ink them up...because they are SO SO cute, and perfect for Fall/Thanksgiving/Harvest type cards. Here is what I created! 1. 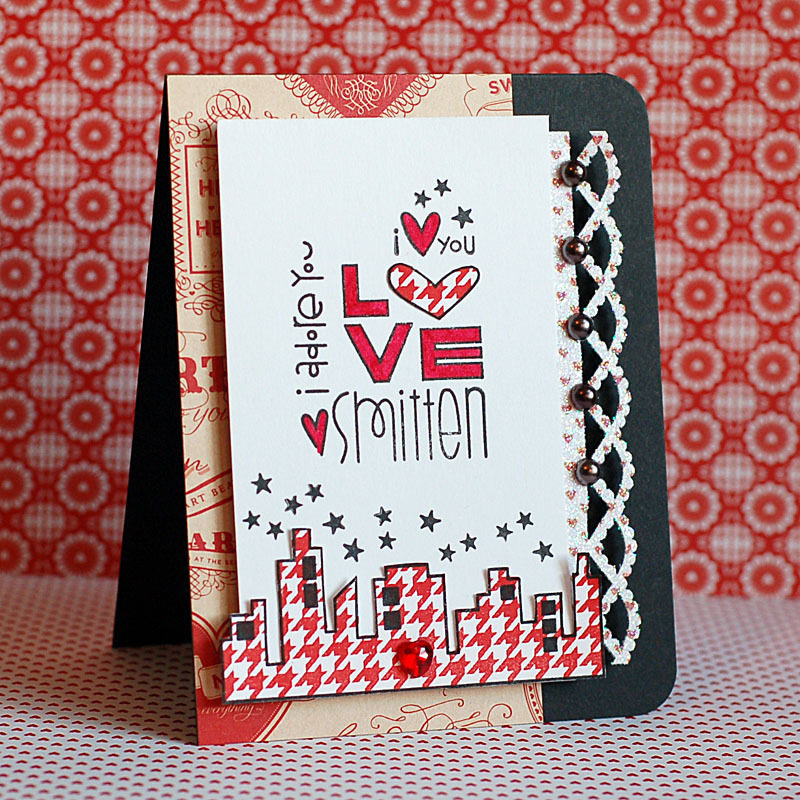 Make 5" square card from brown cardstock. 2. Cut polka dot paper slightly smaller, distress ink the edges and adhere. 3. Distress ink two doilies, and adhere to the front, wrapping the excess around each side. 4. Distress ink a lined paper block and adhere to the middle. 5. Diecut a label from doily paper, distress ink and adhere to the front. 6. Diecut the scarecrow & basket layers, distress ink & stamp as shown. 7. Adhere to the label cut, then accent the basket with pearls. 8. Tie a bow from gold ribbon, adhere to the upper left corner & accent with flowers. 9. Stamp the sentiment to a vellum strip, then adhere a strip of glitter to the bottom of it. 10. Adhere the vellum strip to the bottom of the card, then accent with pearls to finish. You can just call me Effie, if you'd like! Tee hee! I hope you have a great rest of your Sunday, and the last little bit of your weekend! Happy Friday, everyone!! We've made it through another week!! And can you believe it is November....seriously, where has this year gone?! The next two months are going to just fly by...full of baking, shopping, celebrating, loving...I just want to try and savor every moment of it. Don't you agree? We are going to head to the library to pay some late fines (OOOPS!) and pick out some new books & such. I think I want to have a game night tonight...just waiting to see if some of our friends get back to us. If not...maybe just the two of us will play games....tee hee! I have a clean & graphic card to share with you that I created today. It uses the My Mind's Eye Follow Your Heart "Be Amazing" collection, and some older stamps from Glitz Design, which I just LOVE. I loved this week's sketch at CAS(E) This Sketch!, and I wanted to share how it could be used with more than a single layer. Here is what I made! 2. Cut graph paper slightly smaller, then adhere. 3. Cut out hexagons from patterned paper, and adhere to the left side with foam adhesive. 4. Stamp the sentiment to a dotted paper banner, then layer to the bottom hexagon with a diecut star & twine threaded button. 5. Add a twine threaded grey button & two brads to the upper corner of the hexagons. 6. Wrap twine around the top, add a double bow and accent the center with a brad to finish. I know I went a little crazy with the layering yesterday, so I figured a little "less is more" was a good idea for today. Tee hee! I hope you like my male inspired card today!! Have a great rest of your Friday!! Here are my latest Bible study notes. I read somewhere online that the word "Holy" is used 567 times in Scripture. Truthfully people....I'm going to take their word for it. Ha! Pretty sure I'm not going to go through the entire Bible and count it for myself. Let's just take it at face value that holiness is a pretty important part of the Bible. I did a small word study on the Hebrew word for Holy; which is kadesh, and means "set apart". This reminds me that it is written to be "in this world, but not of this world." I don't feel like I always know what that means. It's been explained that we are "supposed to look or seem different" to others....still not completely sure what that means. I do know that being holy doesn't mean being "holier than thou". I know I will fail at it more than I succeed, but God knows that my heart is in the right place. I know that He will gently remind me when I'm not acting very holy. And I know that striving for holiness is a lifelong venture...it will not happen overnight, & I will never reach it fully. But it is always something to keep striving for. Happy Thursday, everyone!! Did you have an awesome Halloween yesterday? We had a pretty normal day, but we had a lot of fun at small group. Our pastor dressed up as Eddie from National Lampoon's Christmas Vacation, including the black dickie showing underneath the white sweater.....CLASSIC. We played a couple games together, laughed and had fun! When we got home, we watched the 1998 remake of Psycho....not even close to as good as the original, but it was what was available on Netflix that wouldn't give me nightmares. Tee hee! We are dressing up for a costume murder mystery party on Saturday...and I CAN'T wait!!! It is going to be SO fun! 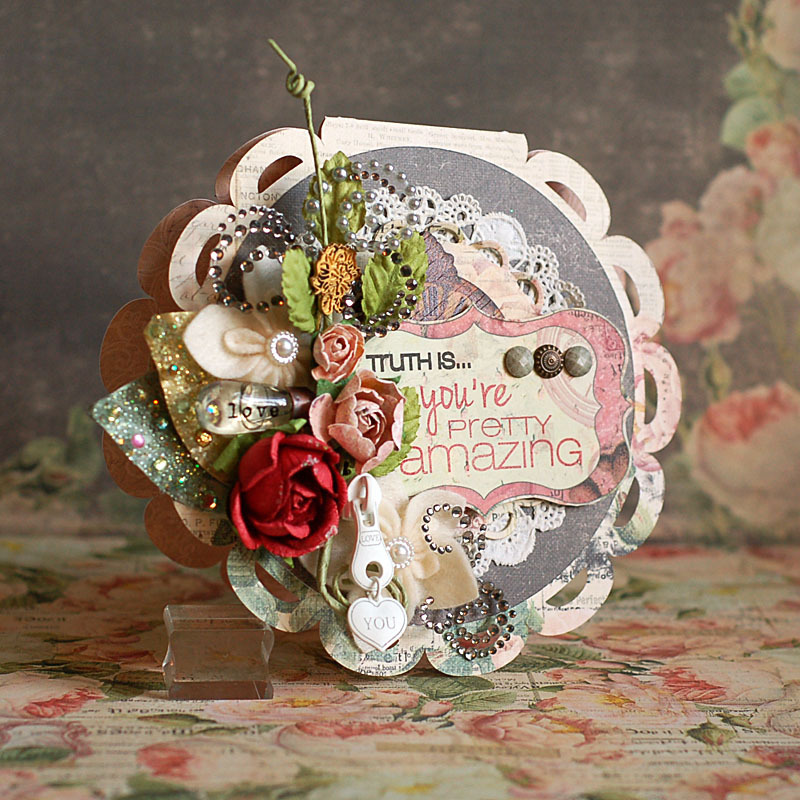 I have a card to share with you today, that I went a little crazy embellishing. So, please ignore the fact that I had to prop it up in the photo with one of my clear blocks....the card is a little heavy on the left side. Ha!! 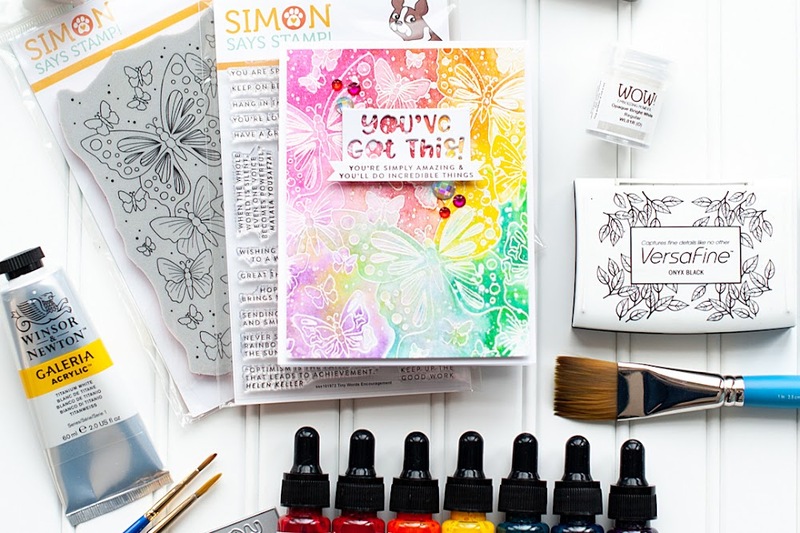 This card uses a lot of the Prima "Tea Thyme" collection, and a lovely stamp set from the new company CAS-ual Fridays Stamps. 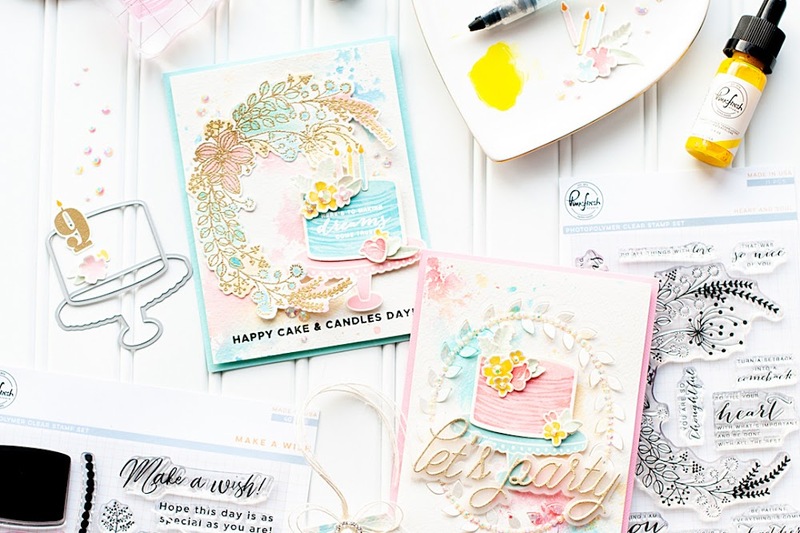 The challenge blog now has it's own stamp company...and that is fantastic!! I love seeing all these new little companies popping up here and there...it's awesome! While my card is not even remotely clean & simple...I wanted to showcase that you can still use their fabulous stamps. Here is what I created! 1. Cut doily shaped card from floral paper at 5 3/4" using the Cricut Expression & Wild Cards cartridge, then fold in half. 2. Cut a circle from grey paper at 5 1/4" using the same cartridge, then adhere to the front. 3. Distress ink a doily, then adhere to the middle. 4. Diecut the lacey circle from floral paper, then layer with a wooden clock to the front. 5. Cut out the label, stamp the sentiment to it and adhere with foam adhesive. 6. Accent the sentiment label with jewels. 7. Layer together the flowers and leaves to the left side of the sentiment. 8. Accent the flowers with jewel flourishes, a gold pin, the love bulb, and the love zipper to finish. So, I have had people ask me how you send a card like this. The short answer...not in a normal envelope. Ha! I use cards like this to decorate gift packages quite often. Or, if you want to send just the card...I suggest using a padded envelope that is a little bit larger. 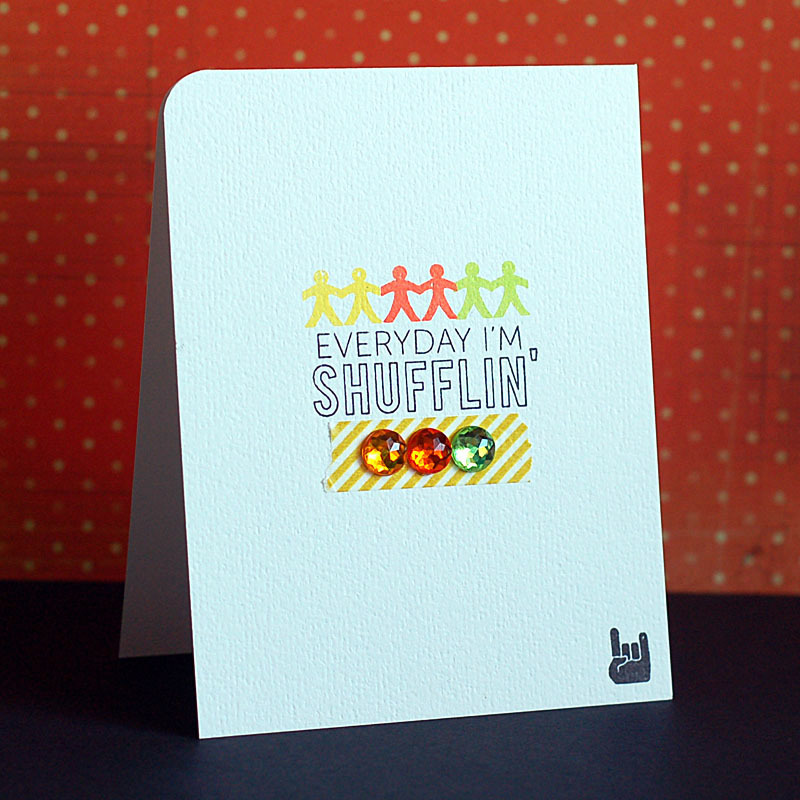 No matter what, a card like this is going to cost more to send...so I find that is the best way. It's time to start a new book in my Bible study!! I am studying 1 Peter, and then 2 Peter will be next...so let's get started! Before I dive into my thoughts on the verses, I want to make a short list of things I know about Peter. He was one of the 12 disciples...he was the first to realize Jesus was the Messiah...he completely misunderstood Jesus' mission...he denied Jesus three times during His trial...but was forgiven & restored by Jesus upon His resurrection. I have a very close friend who said to me once (in regards to faith), "You start at Jesus, and go from there." So simple, and yet so true. The fact is as Christians we don't have to agree on much, but we do have to agree on Jesus...what He did...and that He is returning to us. Verses 8 & 9 just give me goosebumps, "Though you have not seen Him, you love Him; and even though you do not see Him now, you believe in Him and are filled with an inexpressible and glorious joy, for you are receiving the end result of your faith, the salvation of your souls." The honest truth is the joy I feel in my life because of Jesus IS inexplicable...hard to understand...hard to put words on. And it's hard to describe my belief in Jesus, other than I just do. Faith is defined as "belief that is not based on proof." Pretty sure Jesus is historically proven as man. But I believe in His divinity. I believe in what His mission was on Earth. I believe in Him as a Messiah....a Savior. Yet...I still get to call Him friend. Amazing, I tell you....simply amazing.